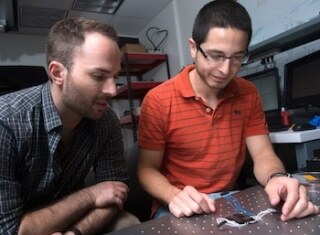 Rice University's Jacob Robinson, left, an assistant professor of electrical and computer engineering, watches as graduate student Daniel Gonzales assembles a microfluidic device designed to capture electrical signals from nematode muscle cells. CREDIT: Photo by Jeff Fitlow. The measurement of electrical activity in individual cells of smaller living animals has been simplified by microscopic probes designed at Rice University. With this new method, a single animal such as a worm can be repeatedly investigated. The method can also transform data-gathering for drug interactions as well as disease characterization. “Nanoscale suspended electrode arrays,” commonly known as nano-SPEARs, invented at electrical and computer engineer Jacob Robinson’s Rice lab enables researchers to access electrophysiological signals from the cells of small animals without causing any harm to them. Nano-SPEARs can be used in place of glass pipette electrodes that have to be aligned manually during every usage. One of the experimental bottlenecks in studying synaptic behavior and degenerative diseases that affect the synapse is performing electrical measurements at those synapses. We set out to study large groups of animals under lots of different conditions to screen drugs or test different genetic factors that relate to errors in signaling at those synapses. The study has been recently described in detail in the journal Nature Nanotechnology. The subject of Robinson’s prior research at Rice University was high-throughput, high-quality electrical characterization of individual cells. The new platform enables the concept to be applied to investigate the surface cells in nematodes, that is, worms making up about 80% of all animals globally. According to Robinson, most of what is known about synaptic transmission and muscle activity in worms is from the few studies that successfully applied manually arranged glass pipettes for measuring electrical activity from individual cells. However, this patch clamp process mandates invasive and time-consuming surgery that can have a negative impact on the data collected from small research animals. The platform designed by Robinson and his colleagues is similar to a toll booth for traveling worms. Each worm moving via a narrow channel is temporarily immobilized and pressed against one or multiple nano-SPEARs. The nano-SPEARs penetrate the body-wall muscle of the worm to record electrical activity from adjacent cells. Then, the worm is released, and the next one immobilized and the measurement is taken. According to Robinson, when compared to conventional electrophysiological cell measurement methods, the new device was much faster. The thickness of the nano-SPEARs developed using standard thin-film deposition techniques and electron-beam or photolithography can range from 200 nm to over 5 mm, depending on the size of the to-be-tested animal. Robinson stated that since the nano-SPEARs can be developed on either glass or silicon, the method can be easily combined with fluorescence microscopy. The size of the animals that are suitable to be probed with a nano-SPEAR can be several millimeters, such as hydra, cousins of jellyfish and the subject of an upcoming study. However, nematodes called Caenorhabditis elegans were practical for various reasons according to Robinson; first, they are adequately small to be compatible with nanowire electrodes and microfluidic devices. Second, a lot of these nematodes were available at the lab of Rice collaborator Weiwei Zhong, who considers nematodes to be easily manipulated, transparent models for signaling pathways common to all animals. I used to shy away from measuring electrophysiology because the conventional method of patch clamping is so technically challenging. Only a few graduate students or postdocs can do it. With Jacob’s device, even an undergraduate student can measure electrophysiology. The research team reported that first-hand investigations of C. elegans as models for Parkinson’s disease and amyotrophic lateral sclerosis disclosed clear differences in electrophysiological responses between the two. Investigations on the efficaciousness of drugs will be assisted by the potential to investigate small animals for longer periods of time. What we can do, for the first time, is look at electrical activity over a long period of time and discover interesting patterns of behavior. The lead author of the study Daniel Gonzales stated that certain worms were analyzed for close to one hour, and the rest were analyzed on various other days. Daniel Gonzales is a Rice graduate student in Robinson’s lab who was in charge of gathering nematodes via the microfluidic devices. It was in some way easier than working with isolated cells because the worms are larger and fairly sturdy. With cells, if there’s too much pressure, they die. If they hit a wall, they die. But worms are really sturdy, so it was just a matter of getting them up against the electrodes and keeping them there. The researchers used multiple channels to build microfluidic arrays, which enabled the analysis of numerous nematodes at the same time. Compared to patch-clamping methods that restrict labs to analyze only about one animal in an hour, Robinson stated that he and his colleagues measured close to 16 nematodes in an hour. “Because this is a silicon-based technology, making arrays and producing recording chambers in high numbers becomes a real possibility,” stated Robinson. Graduate students Krishna Badhiwala and Daniel Vercosa, research technician Benjamin Avants, and research scientist Zheng Liu are the co-authors of the paper. Robinson is an assistant professor of electrical and computer engineering. The study was supported by the National Institutes of Health, the Defense Advanced Research Projects Agency, the Hamill Foundation, the National Science Foundation, the Keck Center and the Gulf Coast Consortia.